The Gaslamp Artisan Market presented by the Gaslamp Quarter Association and operated by Community Crops open every Sunday! 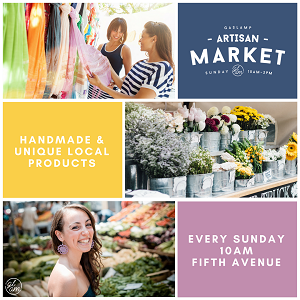 Sunday, April 15, 2018 marks the beginning of the Gaslamp Artisan Market on Fifth Avenue, where more than 30 local artisans will offer carefully-curated homemade and unique local products. Situated in the heart of the historic Gaslamp Quarter, the market is held each Sunday from 10 a.m.-3 p.m. on Fifth Avenue between Market Street and J Street, near popular shops and restaurants. The Gaslamp Artisan Market is the ideal shopping destination for the creative, style-conscious consumer. Browse and shop for clothing, jewelry, and hand-crafted wood items. Pick up fresh flowers for that special someone. Or finish decorating your space with amazing locally-produced home goods. Stay awhile! The Gaslamp Artisan Market is free for all visitors and will feature comfortable seating and shade. We are also hosting live musical acts to entertain the crowd. At the market, you’ll be able to spend the afternoon basking in the San Diego sunshine immersed in an unrivaled ambiance and vibrancy. Every Sunday, 10AM-3PM on Fifth Avenue between Market Street and J Street.